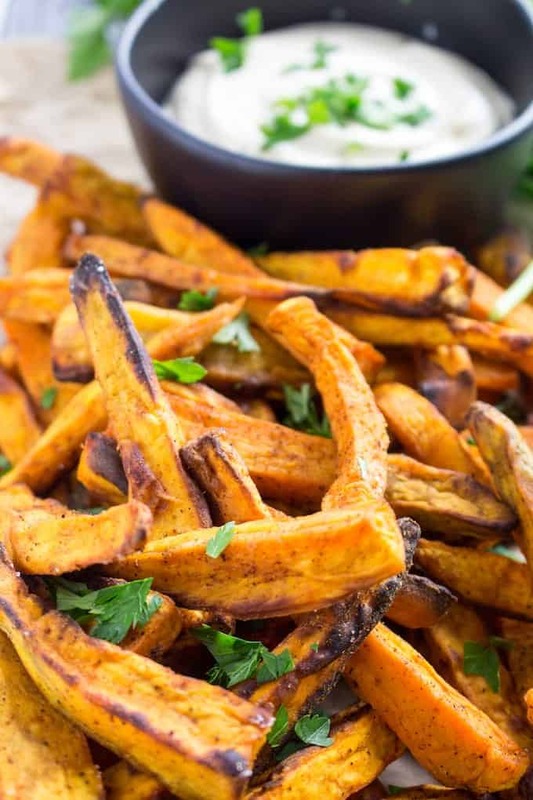 Air Fryer Sweet Potato Fries are cut into thin strips, drizzled with olive oil and tossed with spices for a little kick of heat, then air fried until tender and ready to be served. 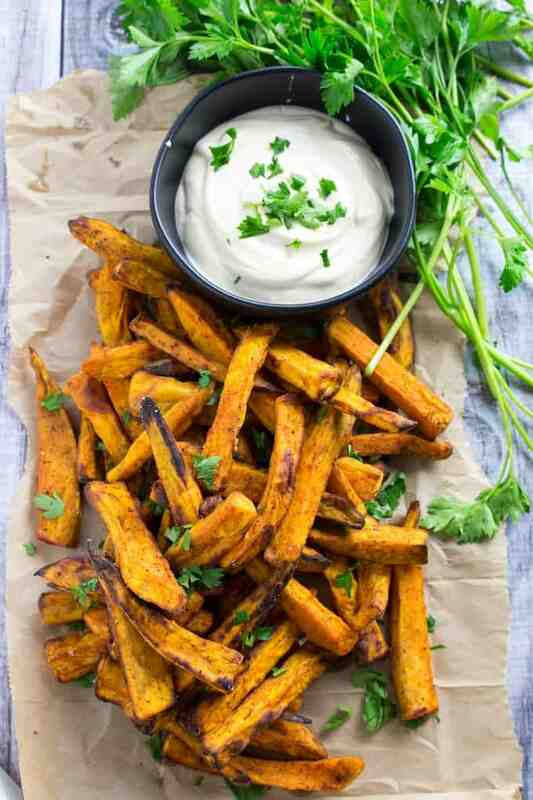 You’ll be surprised how incredibly easy it is to make healthy sweet potato fries at home! I’m all about appetizers this time of year, and I have yet to meet someone who doesn’t want to devour these air fryer sweet potato fries the second they hit the table! If you need a few more appetizer ideas, check out my Spinach Balls, Philly Cheesesteak Dip, and Bacon Wrapped Dates! Air Fryer Sweet Potato Fries are the perfect appetizer to serve at your next get together. I like to pre-soak them, then set the air fryer out with some spices on the side so my guests can season their own fries however they’d like. This is also a great way to have one of the foods we all love, without all of the extra calories! It’s definitely a better choice for those who like to look for a healthier choice, while still getting that same great flavor and texture we all know and love in sweet potato fries. 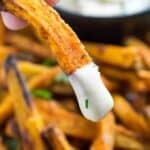 Do homemade sweet potato fries need to be soaked in water? It is important to soak homemade sweet potato fries in water after they are cut for a minimum of 30 minutes. This helps to remove the starch from the potato, which will help them crisp up in the Air Fryer. You can even do this in advance and store in the fridge until later in the day when you’re ready to cook. Once you’re done, lay the fries out on a baking sheet and dry them thoroughly with a paper towel. If you leave too much moisture, your fries will turn out soggy. 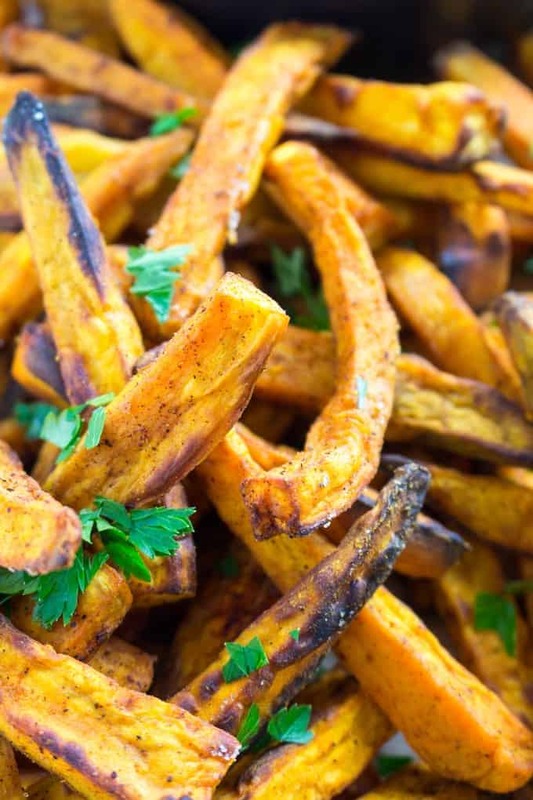 What sweet potato fries seasoning should you use in an air fryer? The air fryer doesn’t really dictate what sweet potato fries seasoning you can use. Which means you can use any of your favorite sweet potato fries seasoning recipes! I like salt & pepper first but adding a little cayenne pepper or garlic powder can give it a better kick of spice. Paprika also works well here, and if you like a smokier taste, choose the smoky Paprika. Experiment with the flavors you love and I’m sure you’ll find a winner! One important note here though, make sure you add just a little bit of oil. I know the big selling point of air fryer sweet potato fries is that they don’t have to be fried, but this is significantly less than if you really fried it. You can drizzle and toss your healthy sweet potato fries, or lightly coat them in cooking spray. This will also help your spices stick! What Do You Dip Homemade Sweet Potato Fries In? Sweet Potato Fries can be dipped into any of the classics like plain ketchup or BBQ Sauce, but I whipped up a little dijonnaise for the occasion. You can vary which dip you choose based on your sweet potato fries seasoning. 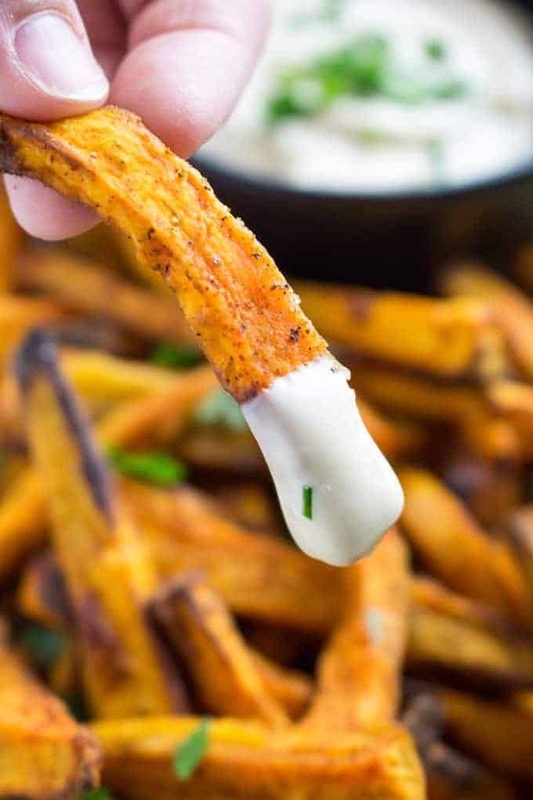 Once you’ve mastered how to make sweet potato fries, dijonnaise will seem like a piece of cake! Don’t skip the soaking part of the recipe. For homemade sweet potato fries, this removes some of the starch from the potatoes, and it’s key to getting them to crisp up! Garlic Parmasan is a favorite combination of mine. I add 1 tbsp grated parmesan and 1/4 tsp garlic powder after the fries come out of the air fryer. The thicker your fry, the harder it will be to get them crispy. Go for a thinner cut. Teach everyone you know how to make sweet potato fries in the air fryer. We need more of these in the world. What do you eat with sweet potato fries? Homemade sweet potato fries go really well with any dish you’d typically serve fries with. Honestly though, I just eat them by themselves. Because once I learned how to make sweet potato fries, I quickly learned that sweet potato fries make excellent snacks! 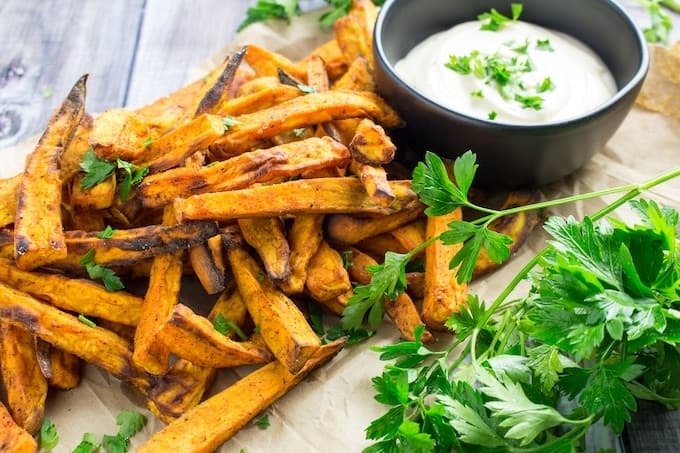 Air Fryer Sweet Potato Fries are cut into thin strips, drizzled with olive oil and tossed with spices for a little kick of heat, then air fried until tender and ready to be served. 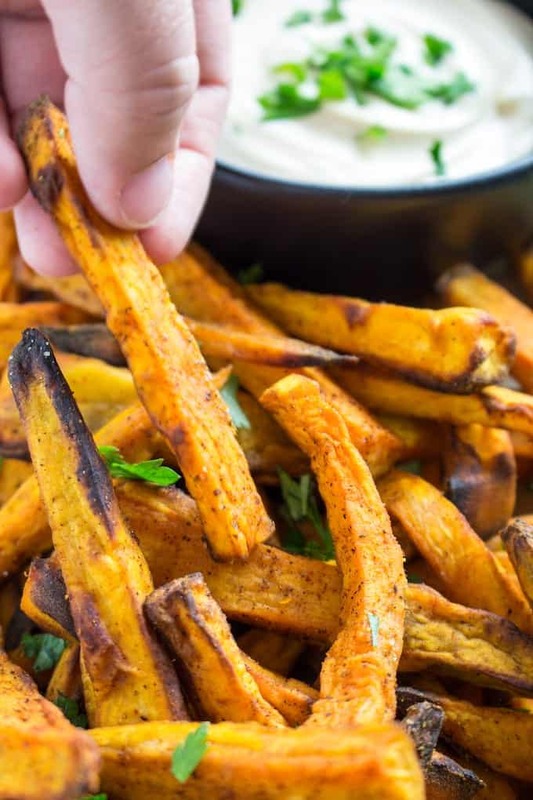 You'll be surprised how incredibly easy it is to make healthy sweet potato fries at home! Soak potatoes in water for 30 minutes to remove the starch. Drain and spread out on a baking sheet, drying them with a paper towel. Drizzle with oil and toss to coat all of the fries. Add season and toss again. Add fries to air fryer (you may have to work in batches depending on how big your fryer is). Set airfryer to 390F for 20 minutes. Take basket out and stir fries every 5 minutes.